With several recent advancements in home security technology, more and more people are resting easy knowing that if their homes are broken into, help is on the way. However, even the smartest technology has its flaws. Despite law enforcement’s best efforts to reduce response time, not all homes are in a convenient location for an immediate response. Additionally, while a home security system will alert the authorities of an intruder, your family isn’t necessarily safe until police arrive. Adopting a reliable guard dog can be an effective way to protect your home and family. However, some dogs are better at the job than others. 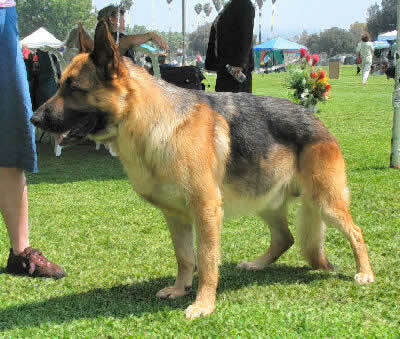 German shepherds are known for their intelligence, strength, and protective nature. It’s for these reasons German shepherds are the most popular choice among law enforcement agencies’ K-9 units. German shepherds can learn simple commands after only 5 repetitions or so. They are also very obedient, responding to a first command 95% of the time. German shepherds are also very strong, which is why they are often employed in search and rescue efforts. Larger shepherds can weigh up to 100 pounds or more, which is not a bad attribute to have in the case of a home intrusion. On average, German shepherds bite with around 236 pounds of force (that’s in comparison to a human male’s 80 pounds). They also rank high on speed and agility tests. This breed is very good around children. As dogs are pack animals, German shepherds in particular have a keen sense of family; they can easily pick out who is not welcome. The one drawback is that modern German shepherds suffer from hip dysplasia, a genetic condition which can lead to arthritis in later years. 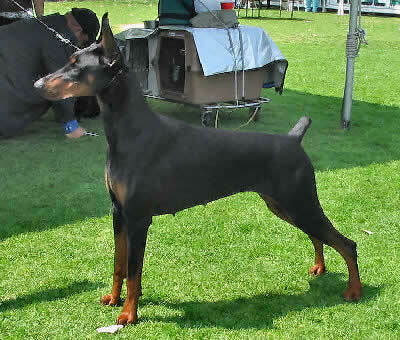 An intimidating figure, the Doberman pinscher is another intelligent breed that can be easily trained. One advantage to owning a Doberman is that they are very easily identified—stopping potential crooks in their tracks before they even start. Dobermans are similar to German shepherds in a lot of ways, including their aptitude for companionship and their relative size and strength. And while they can be very aggressive toward unwanted guests, they also have the potential to act more hostile around any stranger—friend or foe. However, Dobermans tend to rank lower on overall aggression and are great household pets when properly trained. If you want a big, mean dog standing guard, a Rottweiler might be the best choice. 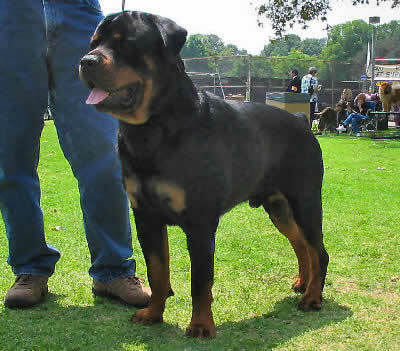 Rottweilers easily weigh in around 130 pounds or more. As opposed to the German shepherd, a Rottweiler’s bite force is somewhere in the neighborhood of 328 pounds of force. In addition to being larger and stronger than most domestic breeds, Rottweilers are also known for their persistence and toughness. In other words, not only will Rottweilers ward off intruders, but they’re also more likely to chase after them, even if they are somehow injured in the process. The average lifespan of a Rottweiler is around 9 to 10 years—a bit lower than the other two breeds. This may be due in part to their proneness to obesity. If you decide to adopt a Rottweiler, make sure it is not over-fed and receives plenty of exercise. One advantage guard dogs have over automated security systems is that they provide companionship as well as security. They are pack animals and will be loyal to your pack if they are properly cared for. However, just like your parents have probably told you, dogs are a big responsibility. Your duty to your dog extends far beyond feeding and walking. There is a right way to train your guard dog—neglect, abuse, and starvation are the wrong ways. Before getting a guard dog, consult trainers, breeders, and veterinarians to help you know what to expect and how to keep your dog disciplined in a controlled and healthy way. Drew Kobb, in addition to studying civil law, loves animals, and keeps himself up-to-date on training tips, new aquarium supplies and animal rights news. His interests range all over the medical field, and Drew highlights that range on his blog, Dr. Ouch. I am currently living along and I have been thinking about getting a guard dog for my home. I am so happy that German Shepherds are one of the best protection dogs. I have wanted a German Sheperd since I was a little kid. So, it is great to know that I could be getting one soon.